Today I officially became an aunt to an adorable teeny weeny niece! Meet Isabella! 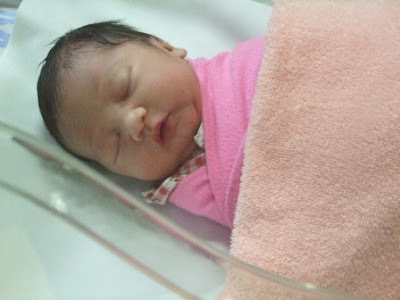 She's the first baby for my younger sister Intan, and is also the first grandchild in the family! 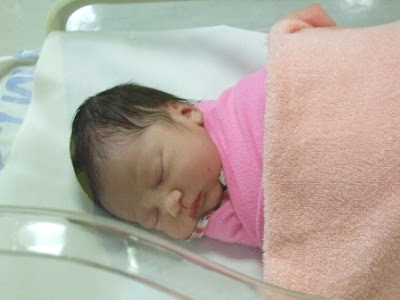 Isabella was born today, 14 September 2007 at 11.08am. She weighed in at 2.96 kgs. Is that a smile I see? She's a Virgo baby, will that make me her favourite aunt since I'm also a Virgo? Nite nite sweetie. Welcome to the world! *Marzie, r u sure she was born 14th Aug? my nephew just turned 1 month ! yey =D and ur niece looks so feminine! He he, too excited sampai salah month! Thanks Helmy, got it fixed! :):):) Wah Ali the avatar is here, how Ali? Cute or not ur new friend? Hi Ting, thanks! Your nephew must be adorable too. Maybe I'll get to see ur nephew's pic soon? Welcome to the world Isabella! Isabella adalah kisah cinta dua dunia ... LOL! Send my congrats to the mom (your sis right?). You so old la now, can be called aunty oredi! LOL! Isabella is in the house!! very sight of the infant greatly enthralls. enjoy the moment.. best wishes. O what a lovely name for a lovely baby! Isabella, welcome to the world! Congrats to your sis, she got a adorable baby there. Soon and later this teeny weeny can plays with you. So now Ali got an 'awek'. oh great! i love this post! That's becasue im so happy for you, aunt marz! Haha! u got to get use to that calling already lor, aunt marz! hehe..
she's adorable and Isabella is a great name! Love it! Who's idea was it? 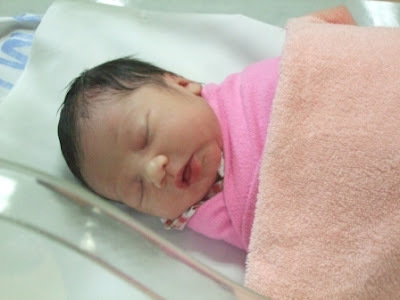 A new born baby, ISABELLA show up in blogosphere! Nah you see! This is what I call the Power of Blogosphere. Spreading the joy and love all over the world no matter you are in little country. It does not matter at all. Little Isabella should be proud of that she got this lovely aunt Marzie to show her up here. At least Isabella is receiving A BIG & WARM welcome from all of us in the world. That's COOL! As we know, Baby is the best suitable and most effective medicine to cure or cheer us up when we are stress. From a pure smile from them, your heart will feel the pure and love and everything will transform to a happier level to see! ISABELLA, a BIG HELLO and HuGzz & Kiss to you from aunt JaMiLLa, Brunei! Pretty name. Isabella... It is really worth a hard labor for the mother. I can really relate how the mother felt when she had her delivery. It's a good experience being a nurse..
Congrats to the new aunty! Thanks for visiting my new blog and your words of encouragement! Hi Marzie, So I can called you autie Marzie now. hehe. Thanks for dropping by MT. Jesse! Thanks for coming by even though ur down with the flu. Get well soon. Thank u Janice! I think my maternal instincts are kickin in now with the arrival of baby Isabella! ;) Would love to have more pics up, yest couldn get ones with her eyes open! How adorable! Congrats and welcome to the little one. Selamat! Apa Khabar? i'm really happy to see Isabella. congrats to you & u'r sister. Let the child be blessed with Good Health, Sufficient Wealth & Success in the future. Wow .. the baby is really a sweetie!! Congrats on being an aunt! Thank you Ida! HUGS :) Wei, bila nak join my carpet ride?! Faster la! Isabella is such a sweetie. Marzie, I know dat feeling and it makes u feel so geram dat u wan 2 kiss her evry now n then !! 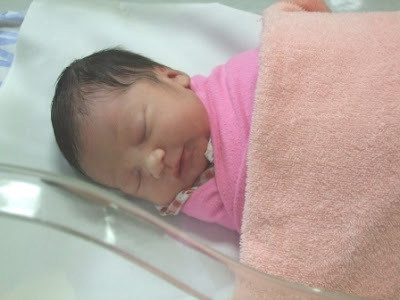 Awww...she is precious..Congrates to you on being and Aunt!! Hi LadyJava! It's nice to see u here again! Yes, a Ramadan baby makes her all the more special and us all the more blessed! Mariuca-Hey there friend! Congrats! She is adorable! How exciting for you, plus she is a fellow virgo! Yay! I have not been able to keep up with your blog because things have been kind of crazy! I will be back in the swing of things soon! Take care my friend! You will make a great Auntie! hi baby issy! you're so grown up now and pretty too! And there is Baby Issy.. wow! she grew up so fast lah!! Time ni. mata pun blum bukak.. now she crawling away already.. ahh teary eyed dah ni!! Comelnya hidung baby Issy ni! Nak cuit2!! :):) She looks so peaceful..ntah mimpi apa agaknya kan? ala la la baby! cium skit!